Deeming herself finally delivered from the Russian peril, Austria was free to bestow her full attention on the Italian front early in 1916. An army of not less than 600,000 picked troops was assembled on the Alpine frontier with 2,000 huge cannon, ready to batter its way through the Italian defenses. The task of crushing Italy was assigned to Archduke Charles Joseph Ferdinand of Austria, assisted by Field Marshal von Hoetzendorff. The Austrians hoped to forestall the expected Italian assault on Gorizia, then being planned, by an attack on Trentino. Concentrating their artillery fire on the front between the Adige and Brenta, they hoped to push through to the Venetian Plain, capture Verona and Vicenza, and then, by threatening the Italian flank, compel a general retreat of all the Italian forces operating along the line of the Isonzo River. From late February until the middle of March, there was a succession of floods and snowfalls, with their resultant avalanches and landslides, rendering military operations difficult. So sudden and resistless were these avalanches that they swept away whole regiments of men and great sources of supplies. The Austrians assisted nature in this destructive work by producing artificial avalanches on the steep mountain slopes by means of mines, bombs and artillery fire. About the middle of March, the Austrians began to develop their offensive. With 2,000 guns available, the artillery fire intensified along the entire front. The Austrians advanced west of the St. Maria Mountain in the Tolmino sector, taking many prisoners. In the Doberdo and Ploecken sectors, and along the Gonby bridgehead, the Austrian guns thundered incessantly for a week from March 26, 1916 to April 1, 1916. Many minor positions were taken by both armies. Early in April General Brusati of the Italian Army was deposed, and his command given to General Pecori-Giraldi. For six weeks, from April 6, 1916 to May 15, 1916, many violent engagements took place on the Doberdo Plateau and along the whole Isonzo front, without affecting the general situation. The Italians, on April 11, 1916, carried with the bayonet a strong line of redoubts along the southern slopes of Monte Pari Cim- adore and the crags of Monte Speron. A part of these trenches were recovered by the Austrians in a counter assault on the following day, only to be retaken that same evening by the Italians in a hand-to-hand struggle. On April 11, 1916, while a blizzard was raging, an Italian force attacked and carried the Austrian positions on the rocky crags of the Lobbia Alta, 1918 feet high, taking several prisoners and one gun. One of the most spectacular episodes of the battle occurred on the night of April 18, 1916. 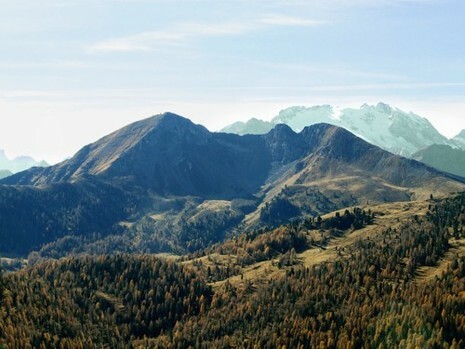 The Italians had occupied Col di Lana Mountain, 4,815 feet high, but failed to drive the Austrians from its western peak, where a battalion of sharpshooters with field and machine guns were strongly intrenched, protected by the Austrian artillery on the adjacent Mount Sief. The Italians solved the problem of ejecting the Austrians by mining the entire western margin of Col di Lana with tons of high explosives. The resultant explosion shook the earth like a mighty earthquake, blowing the mountain peak to atoms and destroying the 1,000 Austrians who occupied the trenches on the peak. The Italian counter-offensive had been so successful that by May 15, 1916 Cadorna's troops were less than 12 miles south of Trent and seriously threatening that city, but now they were to taste the bitterness of defeat. No less than 400,000 Austrians were thrown into the narrow sector of 25 miles between the Adige and the Val Sugana. More than 2,000 guns suddenly rained projectiles of all calibers upon the Italian position. A bombardment of incredible violence ensued. Airplanes regulated the fire of a 15-inch naval gun showered projectiles on the town of Asiago. Following the hurricane of artillery fire, the Austrian troops attacked in mass formation. Four onslaughts were made on Zugna Torta. The Italian machine guns cut down the grey-blue masses of men; the wire entanglements were heaped with dead. The Austrians then hurled themselves against the advance posts of the Val Terragnolo, but the Alpini defended every foot of the ground, fighting always in the snow. Three resolute bayonet attacks lacerated the Austrian lines, but the assailants kept advancing in endless waves. Finally the Italian rear guard threw themselves on the enemy and checked their advance long enough to permit the retirement of the main Italian body to the line running from Malga Milegna to Soglio d' Aspio. Even here there was an avalanche of gun fire, and the Austrian dead filled the valleys, but fresh troops swarmed up from all parts. Night soon ended the first day's dreadful slaughter. After three more days of uninterrupted artillery fire, the Italians vacated their positions between Val Terragnolo and the upper Astico on May 18, 1916. On the same day the Austrians crossed the Italian frontier and established themselves on the Costabella, a ridge of the Monte Baldo chain, driving the Italians back four miles. A day later the Italians were forced from their position on the Col Santo. In the five days of Austrian offensive, 13,000 Italians had been captured and 109 guns. On May 20, 1916, the Italians lost the Borgola Pass, 3,000 men, 33 guns and three howitzers. Everywhere the Austrian advance was successful. The Laurence Plateau, Fima, Mandriole and the heights as far as the Astico Valley were captured in quick succession. Between the Astico and Brenta, the Austrian advance continued in the Valleys of Terra Astico, Doss Maggio and Campelle. Well across the Italian frontier on the way toward Vicenza, the forts protecting Assiero were reduced. By the capture of Spitz Tonezza and Monte Meglignone the Austrian line was made secure across the frontier as far as Forni on the Astico. After storming Col Santo, the right wing of the Austrian Army now moved toward Monte Pasubia, while the left wing stormed the Sasso Alto, enabling the Austrians to advance into the Sugana Valley and take Roncegno. In less than a week the Austrians had advanced their whole line far into Italian territory, across mountains 5,000 to 9,000 feet high, and had taken 24,000 prisoners, 251 cannons and 101 machine guns. By May 26, 1916, the Austrian Center had seized Arsiero, while the right wing had advanced to within 10 miles of Schio, both cities being terminals of the railroad system of which Vicenza is the center. Another force of Austrians meanwhile had captured the entire mountain range from Corno di Campo Verde to Montemeata, taking 2,500 prisoners and 8 guns. Austrian troops, on May 30, 1916, drove the Italians from Gallis and then took Monte Beldó, Monte Fraia and Monte Prufora by storm. Asiago then being threatened, the Italians evacuated the city. The total casualties of the Italians, at the end of the second week of this Austrian offensive were not less than 80,000 men. General Cadorna, on June 3, 1916, issued his memorable order that the Italian troops must defend the last remaining positions to the death. How heroically the soldiers responded was shown in the battle of Mount Ciove, when 4,000 men in a brigade of 6,000 were killed or wounded. The loss of 200 cannon was a very serious matter to the Italians, since these could not immediately be replaced. Austrian airplanes, on June 2, 1916, bombed the cities of Verona and Vicenza, while Italian air squadrons retaliated by dropping 100 bombs on various enemy camps and ammunition depots. Still the Austrian advance continued. On June 3, 1916, Cesuma was captured with 5,600 prisoners and 14 guns.